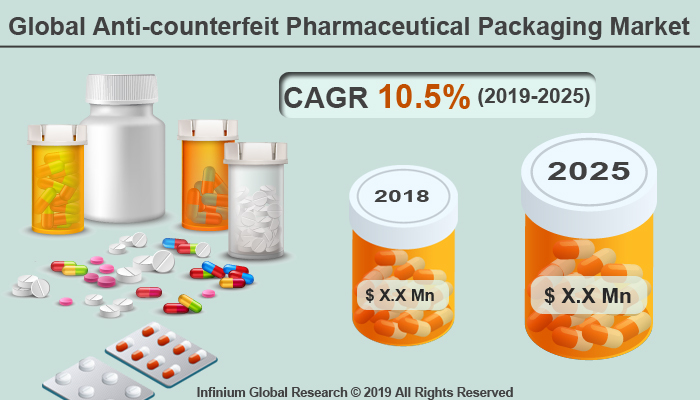 A recent report published by Infinium Global Research on anti-counterfeit pharmaceutical packaging market provides in-depth analysis of segments and sub-segments in the global as well as regional anti-counterfeit pharmaceutical packaging market. The study also highlights the impact of drivers, restraints, and macro indicators on the global and regional anti-counterfeit pharmaceutical packaging market over the short term as well as long term. The report is a comprehensive presentation of trends, forecast and dollar values of global anti-counterfeit pharmaceutical packaging market. According to the report, the global anti-counterfeit pharmaceutical packaging market is projected to grow at a CAGR of 10.5% over the forecast period of 2018-2024. The purpose of an anti-counterfeit feature is primarily to enable the authentication of an item, either by industry investigators, or ideally, by the wider public. Anti-counterfeit is a process of secure packaging that avoids imitation and prevents brand imitation. Additionally, this is easy for consumers to distinguish between original and counterfeit products. Consequences regarding the use of counterfeit products are escalating the growth of the global anti-counterfeit pharmaceutical packaging market. As per the World Health Organization, near about 10% of pharmaceuticals around the world are counterfeit. Counterfeiting products are totally affecting the growth of the pharmaceuticals industry. Thus, a number of organization in the pharmaceutical sector are working on ways to stop counterfeiting products penetrating into the market in order to avoid a negative impact on their sales revenue. However, the high expenditure of anti-counterfeit technology is anticipated to restraining the growth of the market. Furthermore, continuous development and technological advancement in anti-counterfeit packaging technology are expected to increase the growth opportunities for the global anti-counterfeit pharmaceutical packaging market in the near future. Among the region, North America is expected to hold maximum share in anti-counterfeit pharmaceuticals packaging market followed by Europe. The growth of North America is attributed to the strict rules and regulations formulated by the government for the pharmaceutical industry. Moreover, the North America region has vast pharmaceuticals hub which exports pharmaceutical products across the globe. Which in turns, such factors are promoting the growth of anti-counterfeit pharmaceutical packaging market. Moreover, the growing incidences of various diseases resulting in increasing the demand for medical and pharmaceutical products, which are the major driving factor for this market in the Europe region. The Asia Pacific region is estimated to provide substantial opportunities for anti-counterfeit pharmaceutical packaging market over the forecast period. The growing awareness regarding infringement among the consumers responsible for the growth of the Asia Pacific region. The report on global anti-counterfeit pharmaceutical packaging market covers segments such as technology, and application. On the basis of technology, the sub-markets include holograms, security printing and graphics, security ink coatings, RFID, and mass encoding. On the basis of application, the sub-markets include tampered evidence, forensic makers, covert features, and track and trace technologies. The report provides profiles of the companies in the market such as Applied DNA Sciences Inc, SICPA HOLDING SA., AlpVision, DuPont, AVERY DENNISON CORPORATION, ZIH Corp., AZ Coesia GmbH, CCL Industries Inc., and Amcor Limited. The report provides deep insights into the demand forecasts, market trends, and micro and macro indicators. In addition, this report provides insights into the factors that are driving and restraining the growth in this market. Moreover, The IGR-Growth Matrix analysis given in the report brings an insight into the investment areas that existing or new market players can consider. The report provides insights into the market using analytical tools such as Porter's five forces analysis and DRO analysis of anti-counterfeit pharmaceutical packaging market. Moreover, the study highlights current market trends and provides forecast from 2018-2024. We also have highlighted future trends in the market that will affect the demand during the forecast period. Moreover, the competitive analysis given in each regional market brings an insight into the market share of the leading players.